I'm a sucker for fried veggies, but I dont want them to be too breaded-you know what Im talking about...that thick layer of bread where you can't even see the vegetable! 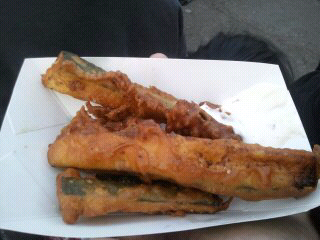 These fried Zucchinis had just the right amount of breading and were very tasty. I found them at the Fish and Chips Booth when I visited Oceanside, CA's Sunset Market. Awesome place BTW. They had all kinds of food from burgers to kabobs, Filipino to Japanese, Mediterranean, you name it they had it. They also had a chocolate dipped strawberry stand which was amazing! It happens every Thursday from 5pm to 9pm...enjoy music, food, and shopping. The beach is also down the street. Next time your in Oceanside, I suggest hitting this place up, its a good time to hang out with your friends and family.